Giannis Antetokounmpo puts up his second triple-double of the season for Milwaukee. 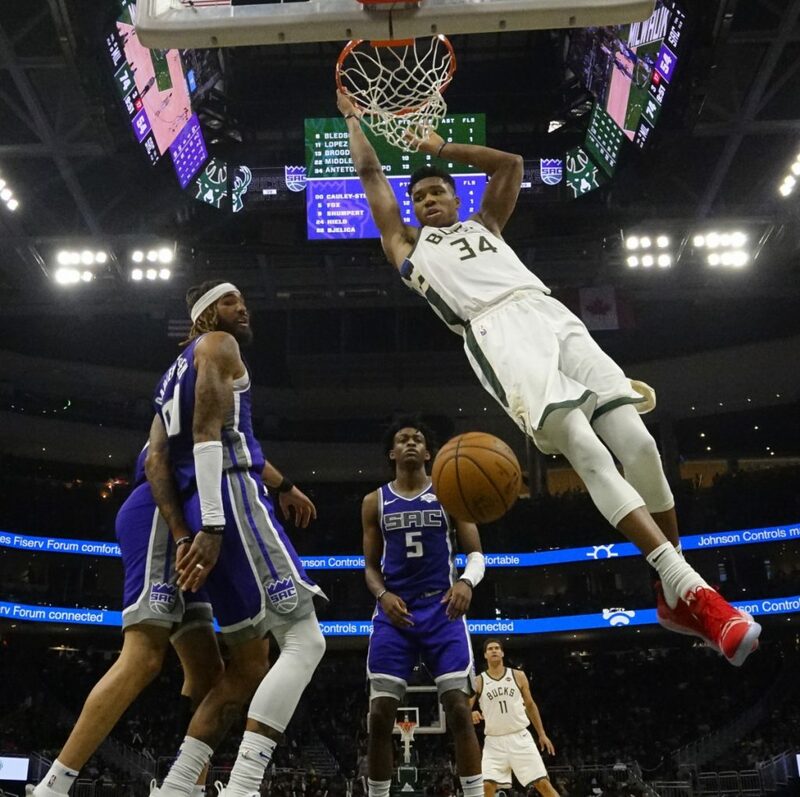 MILWAUKEE — Giannis Antetokounmpo had his second triple-double this season with 26 points, 15 rebounds and 11 assists to help the Milwaukee Bucks rout the Sacramento Kings 144-109 on Sunday. The Bucks improved to 8-1 – the best nine-game start in franchise history. They set a season high for points in a game and also set the franchise record for 3-pointers made with 22. Antetokounmpo completed the triple-double with his 10th assist when he found Pat Connaughton in the corner for 3 and a 108-82 lead as time expired in the third quarter. Antetokounmpo finally went to the bench with 7:48 left in the fourth and the Bucks comfortably ahead 118-90. He pushed the lead to 78-54 with two thunderous dunks seconds apart in the third quarter. He slammed one home and then dunked again on a pass from Khris Middleton after a turnover by De’Aaron Fox on the Kings’ ensuing possession. Antetokounmpo’s first triple-double came against Philadelphia on Oct. 24 when he had 32 points, 18 rebounds and 10 assists. Justin Jackson set a career high with 22 points, Buddy Hield had 19 and De’Aaron Fox 15 for the Kings who had their five-game winning streak snapped. The Bucks started to take over with a 12-2 run in the second quarter, keyed by seven points from Malcolm Brogdon, and led 72-48 on Ersan Ilyasova’s 3 with 49 seconds left before the half. Ilyasova scored 15 points and Antetokounmpo and Eric Bledsoe each added 13 as the Bucks surged to their best first half of scoring so far this season and led 72-50 heading into the third. Both teams let it fly from behind the arc. Milwaukee made 11 of 29 3-point attempts, including three by Ilyasova, to Sacramento’s 6 for 19. NETS 122, 76ERS 97: D’Angelo Russell snapped out of a slump with 13 of his 21 points in the second half, and Brooklyn kept the sloppy 76ers winless on the road. The 76ers committed 28 turnovers, most in the NBA this season, leading to 39 points for the Nets. They fell to 0-5 away from home. They are 6-0 in Philadelphia. Rondae Hollis-Jefferson also scored 21 points and Caris LeVert had 20 for the Nets. They took a small lead into halftime thanks to 17 Philadelphia turnovers, then blew it open with a 41-point third quarter that was one of the biggest in Barclays Center history. MAGIC 117, SPURS 110: Aaron Gordon scored 26 points and Orlando held on at San Antonio after nearly blowing a 26-point lead with 9 minutes remaining. D.J Augustin added 18 points for Orlando, which scored a season high and hit 12 3-pointers. DeMar DeRozan had 25 points as San Antonio’s four-game winning streak came to an end on the second night of a back-to-back. Orlando snapped a four-game skid, but had to bring its starters back into the game to preserve the victory. The Spurs went on a 25-6 run over 6 minutes to cut into the Magic’s 105-79 lead, held with 9:02 remaining. WIZARDS 108, KNICKS 95: John Wall scored 26 points and Bradley Beal added 22 as Washington broke a five-game losing streak with a win at home against the Knicks. Markieff Morris had 16 points and Jeff Green added 14 for Washington, which won for the second time in nine games. The Wizards entered the game having allowed the most points in the NBA. The Knicks, who fell to 3-7, were led by Enes Kanter’s 18 points and 12 rebounds. Trey Burke had 13 points.